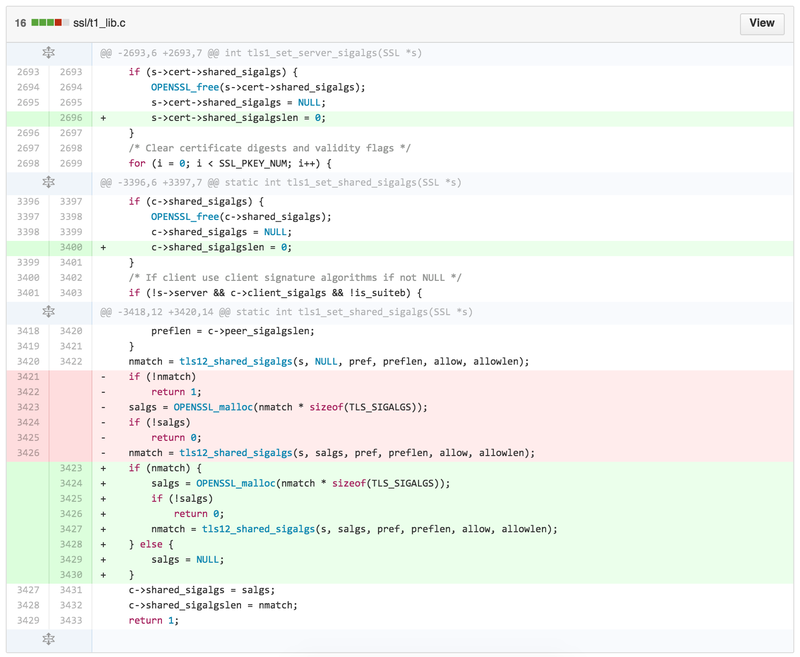 As announced, OpenSSL releases a patch to a high severity vulnerability in the library. For OpenSSL v1.0.2, this is the Denial of Service CVE. occur. This can be exploited in a DoS attack against the server. For OpenSSL v1.0.1 and v1.0.0 and v0.9.8, it's this one (also a Denial of Service). So it's upgrade time again, although the impacted systems could be a relatively small subset of your servers. However, if you're vulnerable, you may want to give this some priority. The patch (the actual changed code) to the v1.0.2 vulnerability is like this. Full commit is here: 34e3edbf3a10953cb407288101fd56a629af22f9. The 0.9.8, 1.0.0 and 1.0.1 patches are much smaller, but have the same DoS effect. Full commit is here: 02758836731658381580e282ff403ba07d87b2f8. The feared Denial of Service attack is, unfortunately, not limited to OpenSSL v1.0.2, as was anticipated. It affects v1.0.1 and v1.0.0 and v0.9.8 as well. Announcing these kind of patches in advance, even without publishing the details of the patch or the CVE, will surely attract the attention of some bad guys as well. You can be sure they were awaiting the release and are now working on ways to make use of it. Having said that, this kind of responsible disclosure is of the best kind: everyone knows in advance to reserve (human) resources in order to deal with the problem. OpenSSL did it right for 90%. The remaining 10% would have been deserved if they had bothered to securely and discretely update LibreSSL of this issue, so they could prepare patches on their end as well. Update: OpenSSL did inform the LibreSSL team of this vulnerability. A well-deserved 100% score for this responsibly disclosed vulnerability. As usual with OpenSSL patches, it's a 2-step fix. First, update the library on your OS. Then, find all services that depend on the OpenSSL libraries, and restart them. Since the attack is a remote DoS, you should restart the public facing services as soon as possible. The internal services could be done at a later, more convenient, time. Note: local system users may still be able to exploit those internal services, but it's another requirement in the whole exploit. Short-term, attackers will aim for the low hanging fruit: externally available services. Every time something like this happens, either in OpenSSL or in glibc, I keep thinking about mapping these library dependencies in config management. Maybe some day, I'll make a proof of concept for this. And some day, it'll save me a few hours of work, for every emergency patch that comes out. Some day. Apologies, that didn’t get enough public exposure apparently, I missed that. I updated my blogpost to reflect that!